Title Security is excited to announce the arrival of Crista Tumminia as our new Manager and Senior Closer. 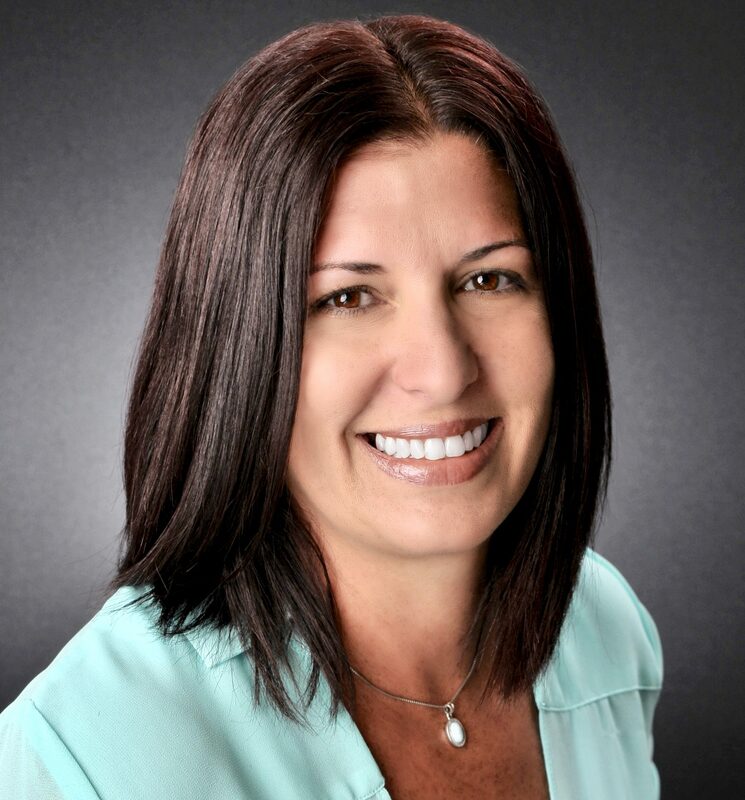 Crista brings a wealth of knowledge and professional style that will help us continue our 35 year tradition of delivering high quality title insurance services in the Tampa Bay area. Please visit our website for more information regarding Ms. Tumminia and we certainly invite you to call or come by. Our goal continues to be your title company for professionals and to make your real estate transactions a smooth and efficient experience. Categories: Title Security | Tags: Crista Tumminia, Senior Closer, Title Insurance | Permalink. Introducing TitleCapture… Your New “Go To” App. Categories: CFPB, Title Insurance, Title Security, TRID | Tags: Buyer Estimates, Seller Net Sheets, Title Insurance, TitleCapture, TRID | Permalink. ALTA: Your long home-buying journey is almost over. You found the home you love, the seller agreed to your offer and now it’s time for closing. Of course, there’s a lot to think about right now, and the last thing you want is something­ to go wrong. So make sure you work with an experienced closing agent to help ensure the details come together and everything runs smoothly. As soon as the seller accepts your offer, the behind-the-scenes work begins. 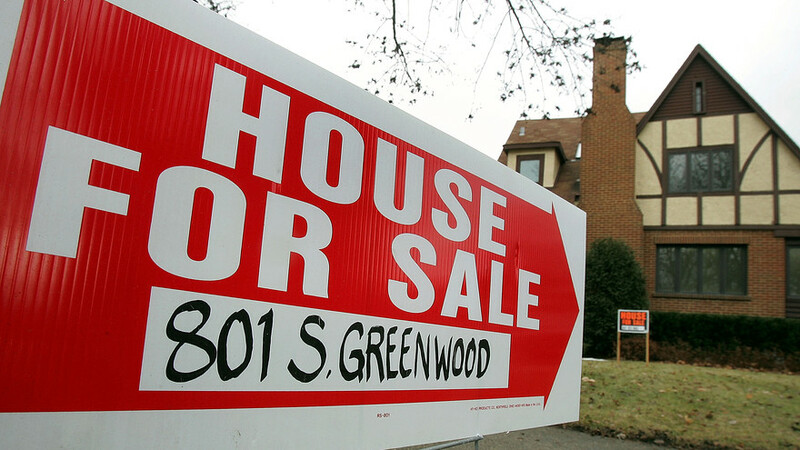 You can expect closing to happen within 30 to 90 days. Categories: Home Buyers, Title Insurance | Tags: ALTA, Closing Agent, Closing Disclosure, Home Buyers, Lender's Policy, Owner's Policy, Title Insurance, Title Search | Permalink. St. Petersburg, Fla. – (January 10, 2017) – Title Security has been selected by JMC Communities to provide Title Insurance and Escrow Services for the newly announced 132 residence, Belleview Place in Belleair. Title Security has had a long and successful relationship with JMC, having closed approximately 2,550 condominium homes for them throughout the Tampa Bay area. Most recently, Title Security handled all closings for JMC’s Ovation, Rowland Place and Victoria Place along with Clearwater Beach’s Sandpearl Residences and Suites. Since 1983, Title Security has been providing comprehensive title and escrow services throughout the Tampa Bay area. “The Title Security team has consistently provided our homebuyers with a friendly and accurate closing experience, and we look forward to working with them on our exciting new Belleair community,” stated Mike Cheezem, Owner/CEO, JMC Communities. Belleview Place is currently selling its 1st Phase. Title Security is a full service title insurance company, enthusiastically handling each aspect of the closing process. 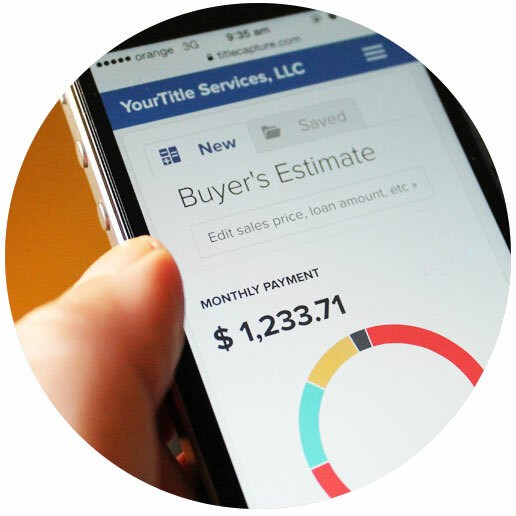 From securing a clear title, to fulfilling lenders’ many closing requirements, to facilitating the document preparation and settlement statement, Title Security creates smooth, hassle-free closings for all parties involved. For additional information, visit www.TitleSecurityFL.com. Categories: Construction, Title Insurance, Title Security | Tags: Belleview Place, escrow services, Harvey Ford, JMC Communities, Mike Cheezem, Title Insurance, Title Security | Permalink. 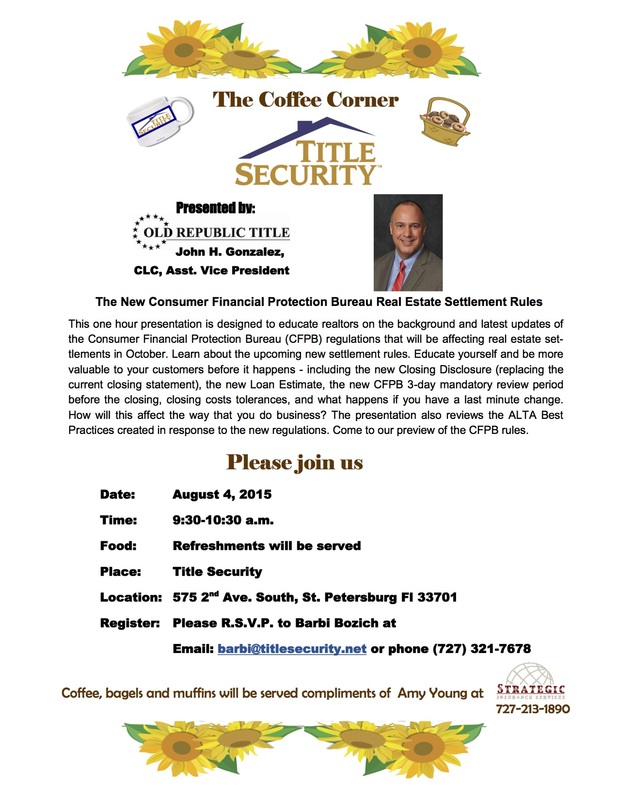 Please Join us August 4th for the latest CFPB information regarding the new October settlement rules. Reduction of private mortgage insurance for FHA loans may be creating more first-time home buyers. Millennials prefer walking to driving …so housing in mixed-use neighborhoods with transit access appear to have an edge. Bringing the grow-it-yourself movement to the city. 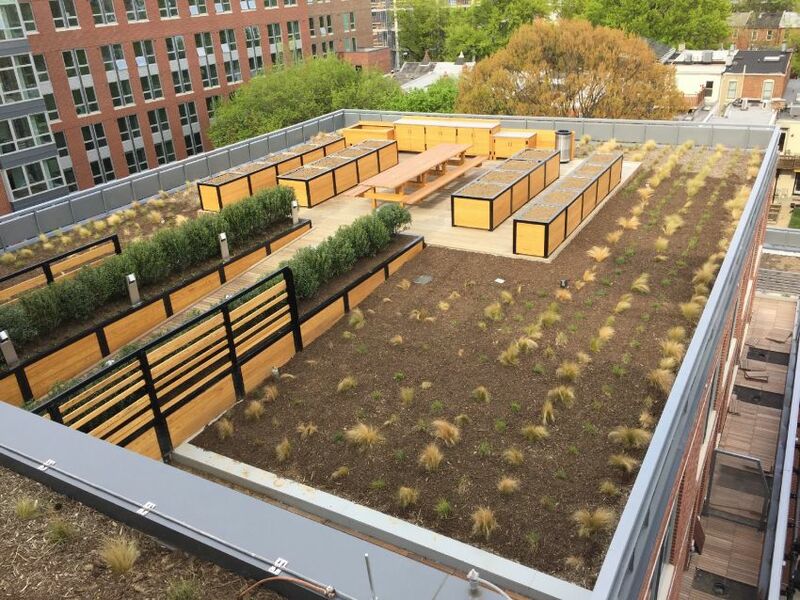 The emphasis is on food activities, with a community garden atop one roof, a 20-foot-long harvest table for produce to be set out, and a demonstration and tasting kitchen where area chefs can show off their skills for tenants. Categories: Construction, Financing, Housing Economics, Millennials, Title Insurance, Title Security, Urban Living | Tags: CFPB, FHA Loans, Grow It Yourself, Millennial Home Buyers, Mixed Use Neighborhoods, Mortgage Closings, Private Mortgage Insurance, Title Insurance, Urban Farms | Permalink. We are very proud and grateful to have been selected by JMC Communities to provide Title Insurance and Escrow Services for their newly announced 30 residence Victoria Place in downtown Dunedin. We have had a long and successful relationship with JMC, having closed approximately 2,500 condominium homes for them throughout the Tampa Bay area. Most recently, Title Security handled closings for JMC’s downtown St. Petersburg’s Ovation and Rowland Place along with Clearwater Beach’s Sandpearl Residences and Suites. Since 1983, Title Security has been providing comprehensive title and escrow services throughout the Tampa Bay area. “The Title Security team has consistently provided our homebuyers with a friendly and accurate closing experience, and we look forward to working with them on our exciting new downtown community,” stated Mike Cheezem, Owner/CEO, JMC Communities. Victoria Place broke ground earlier this month. Categories: Construction, Title Insurance, Title Security | Tags: Dunedin Condos, Dunedin FL, escrow services, Harvey Ford, JMC Communities, Mike Cheezem, Title Insurance, Title Security, Victoria Place | Permalink. Florida’s autumn is almost here. That means Pumpkin Spice flavored everything, Halloween, and slightly less humid days. While our city doesn’t see much of fall and winter, there seems to be a completely different mood in the city when October is upon us and it brings out the best of what St. Petersburg has become in the past few years. If you do a Google search for some of the up and coming cities in America, St. Pete will probably pop up on more than a few. The city has continued to transform into an appealing spot for young couples to settle down and natives to stay put. And the best time of the year to see what the city really has to offer starts in the beginning of the “fall” months. While Snowbirds start to flock to their condos and time-shares, the bustle of the surrounding area starts to pick up. Not to mention the local events that attract both residents and vacationers every year. 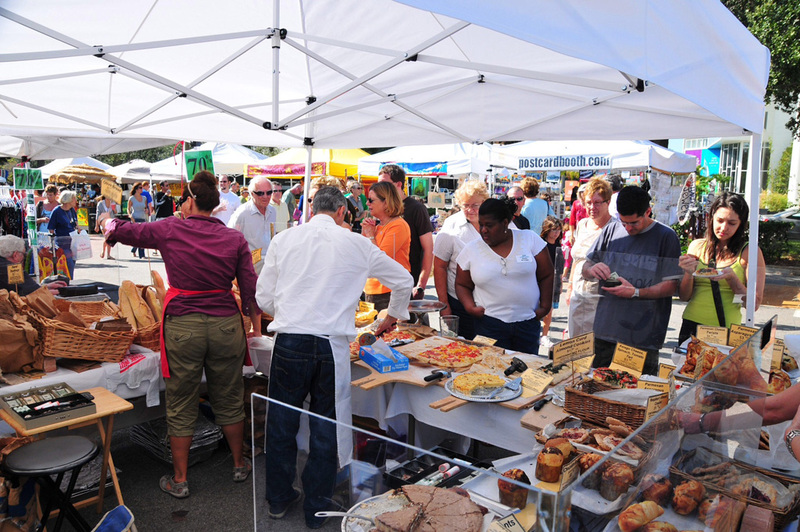 The Saturday Morning Market is the perfect place to start getting to know St. Pete. The local food and services trend that launched out of the East Coast and the Northeast regions of the country has trickled down to Florida. The impact has generated more visitors to open air markets and local boutique shops that are very popular in the downtown district. Many of the local bars and restaurants host parties for beer runs and more family friendly gatherings, like St. Petersburg Preservation’s “Movies in the Park” at North Straub Park. Films like Breakfast at Tiffany’s, The Blues Brothers, and Young Frankenstein are all on the roster to be shown this season. The Florida Orchestra also puts on “Pops in the Park” at Vinoy Park in October which can quickly become a family tradition to attend. Both of these events are free and extremely popular. 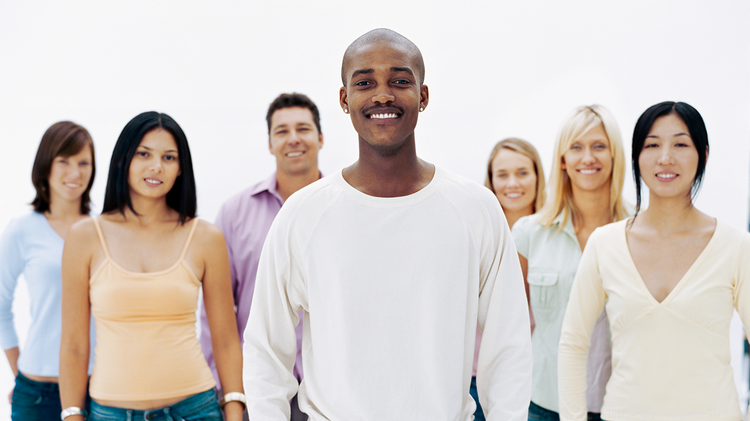 They’re the perfect venue to get to know your neighbors and find out about other upcoming events. Even though Florida doesn’t experience seasons like most other states in the country, St. Petersburg still makes it a point to emphasize what time of year it is. Trick-or-Treating in Old Northeast is always a must do on Halloween. 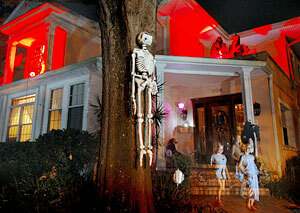 The neighborhood is always full of spooky decorations and kid friendly block parties around every corner. There’s even a house that makes cotton candy! When November rolls around, most communities and schools host canned food drives for local nonprofit organizations. Many art galleries and boutique shops organize galas to raise money for All Children’s Hospital. The events are usually themed and with the purchase of your ticket, sit down dinners and live music can be enjoyed on your night out for a good cause. popular events in winter along with North Straub Park’s ice rink and giant Christmas tree that’s a perfect photo op for next year’s holiday cards. With so many events and activities planned in the fall and winter months, it’s no wonder young families and couples are gravitating toward St. Petersburg to plant their roots. If you want to know what’s going on in St. Pete, visit ILoveTheBurg.com. They have a constantly updated calendar of daily events and reviews on local plays, musicals, comedy and art shows. 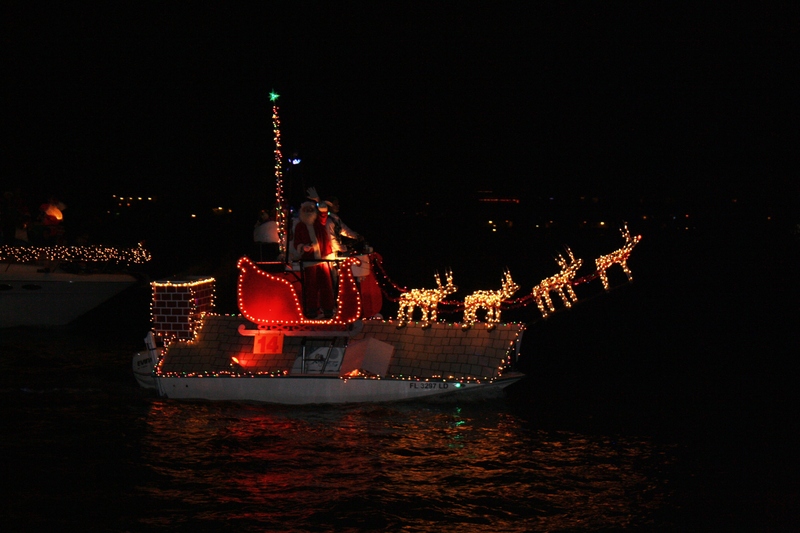 Categories: Personal Development, St Petersburg | Tags: Christmas Boat Parade, Downtown St Pete, Downtown St. Petersburg, Halloween Decorations, Holiday Boat Parade, Love the Burg, Pops in the Park, Saturday Morning Market, Straub Park, The Burg, Title Insurance, Vinoy Park | Permalink.